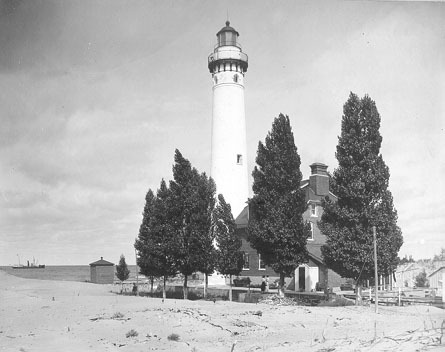 IMPORTANT ROLE IN GROWTH OF SHIPPING ON LAKE MICHIGAN Little Sable Lighthouse, a white brick tower, 107 feet in height, connected to the keeper’s dwelling, and surrounded by a picturesque group of trees, stands on a point about 10 miles south of Pentwater. The lighthouse was built in 1874, and the light now shown from the tower is fixed and flashing white, the flashes being of 40,000 candlepower. Several miles to the northward is Big Sable Lighthouse, on the point of that name, distinguished at night from Little Sable by having a fixed white light, and by day by the color of the tower, banded in black and white. Big Sable Lighthouse is the same height as the tower at Little Sable, but was erected in 1867.